I'm sorry about the lateness of this issue. I'm afraid life has grabbed me by the throat re work and over committing myself...not an unusual occurance I'm afraid. Which is why I can't promise this newsletter will fall exactly on the month, but when it does fall you can expect something informative, interesting and different. The wood show season has been quite a handful for my first time out on my own, but very rewarding in many ways. Actually, our shows here in Australia go all year around, but I concentrate on those within a days drive of me. (Perth is about 4 days from me, so just quietly, I think I might give that one a miss:)) Just Melbourne is left, and being my home city, this one I can afford to jam pack with goodies for Christmas shoppers...well...that's the plan anyway. Yep...that's the plan, but as we all know, life and shows don't always go to plan. In the various groups I belong and via the email I get, I often hear of the nerves and fears of a pyro artist contemplating exposing their work to the public for the first time. Whether it be a church hall or a big wood show, the anxiety is sometimes excruciating and very real...and God forbid this first show goes bad, because getting on that scary horse again for the second is harder still! "If they didn't buy last show, why would they buy at the next show?! I'm a failure! My work is no good! Everyone else seems to sell but me! Don't look at me...I'm hidious"...well, that last bit is an exageration, but you get the gist. There's lot's more in this issue, so much I had to cut out a couple of the planned articles. Never mind...more for next time! This article and interview focus on pyrographic artist, Tom Schulz. Tom hails from Fairbanks, Alaska. He is an amazingly diverse burner who not only burns on the traditional surfaces of wood, cow leather and paper but also works on many varied natural mediums, such as antler, monolith ivory and moose hide. I wrote to Tom asking him about his experiences in ivory burning for this newsletter, but his response had me rapidly changing tact to focus on moose hide burning. This is not only because his work on moose is aesthetically beautiful and warrants mention all on it's own, but also because of a story Tom started telling me. An inspiring story, not only of a pyrographer who has an artistic awareness of his land and nature, but also of one dedicated to historic awareness and mastery of moose hide pyrography. This has led to the recognition of a fine artist and of his community. "Burning on moose hide has it's advantages and disadvantages. For those that have burned on deer hide or thin leather, you know how careful you must be not to burn through it. Also leather and hides will not allow the detail that can be achieved on hard wood like Birch, which is my favorite. "In order to achieve detail, you just work on a larger scale. Hardwood will give you those fine lines. Native smoke tanned moose hide is soft and because of it's texture the heat from your pen (I use a Detail Master), will bleed out causing a thicker line. A great advantage to moose hide is it's thickness. You can burn hot and deep, adding a feel of depth or another dimension. It saved me another step from my old way of leather tooling before burning. None of my leather or hides have a finish. Another step saved. Years ago I used leather dye and shoe polish to add color. Now I've been mostly monochrome. I like color but have gotten fond of the sepia affect, almost an old fashioned photo look, and in my mind,it is most representative of the art of pyrography. Native smoke tanned hide is varied in color depending on how long it has been smoked. The native lady here Molly Galbreath that tans for me knows I like it a light color. If you want it lighter just put it out in the sun. Sandpaper can be used to remove dirt or smooth out the texture." Tom then goes on to explain about how he got started in leather burning. "Working with leather was a great hobby in the beginning. Tooling can be very time consuming. As my interest increased in wildlife, I needed more detail and speed. A woodburner gave both of these and it's been my carving tool and paintbrush since the 1st time in the mid '80,s. Tom then moved on to working on wood to achieve a greater degree of detail. He also started working on paper, ivory and moose antler, all of which required learning new techniques. This honed Tom's pyrographic skills and attention to detail, which he then applied to portraiture. About his wood choice: "Choosing the right wood is important. without adding color, white on an animal portrait can only be as white as the wood you choose. Other tones come out different on every type of wood. I like Birch best for these tones and detail. People portraits are most challenging but most rewarding, with different effects on every piece from paper to moose hide." "It seems a complete circle burning on moose hide now with my love for leather in the beginning. My goal is to continue to expand and grow in pyrography, and live this life as best as I can as a self employed artist. Making the hobby my job hasn't taken the fun out of it, it's only increased the time and pleasure from it. Past factory jobs may have brought more money, but success should not be measured by money. Success comes from putting your heart and soul into your work and enjoying it along with the freedom it gives you. It's about giving, and leaving something behind that touches the hearts of people. The tear in the eye of someone receiving a portrait of a deceased pet brought back to life, says it all." With philosophy in tact, Tom has recently gone a long way to achieving his goals. Recently one of his pyro'd moose hides was presented to the Italian descendants of Felix Pedro, the man who discovered gold in that area of Alaska. (See images above.) They loved the dipiction of Felix so much that they are presenting Tom with a paid trip to Fanano, Italy! There he will attend the international sculptors symposia as a guest artist. While his moose hide hangs in Fanano's 8th century city hall, Tom will be demonstrating his unique skill on another moose hide. To add more good news, another of Tom's moose hides has recently won grand champion in creative arts at the Alaskan State Fair AND Tom also got an official resolution from the Mayor and City Council thanking him and recognizing pyrography as an important art in this area. 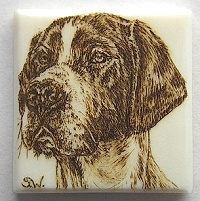 Yep...I think Tom Schulz is well on his way to achieving recognition for pyrography, his State and himself. Well done Tom! These are booklets 3 and 4 in a series. They are not designed around glossy pictures and large patterns. 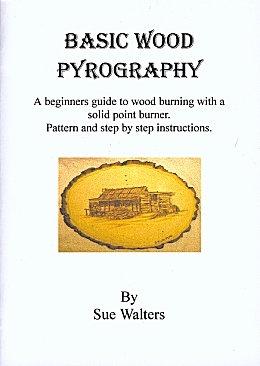 They are an inexpensive, informative guide for the burner targeting specialized pyrographic areas. 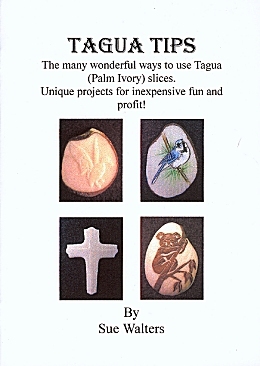 Perhaps you just want to find out how to burn on paper and learn how to use texture to it's full extent, but you don't want to know how to learn about tagua burning? Many pyro books out there look the same, covered the same subjects or you have to buy a large book to learn about the few subjects that interest you. Future editions will cover varied specialized pyrographic techniques that run the gammut of the pyrographic world...and then some. A very good woman pyro I know from the UK recently expressed her frustration and fear at tackling her first market and not selling a thing. Many of us told her to hang in there, that she had very worthy work to show. I know she must have felt slightly terrified it was going to happen again at her next show. After all, her friends and loved ones must have told her she was good....were they all wrong? No....she just had one of those markets...wrong place, wrong time. The next show report had me jumping for joy on her behalf. Not only did she sell, but sold very well indeed. She was naturally very relieved:) I knew it was just a matter of time. I remember my first show was at a Sunday market and I was just about sick before it! I also remember it didn't go very well. With a lump in my throat I returned the next week and did much better. The next fell somewhere between the first two...the following was a boomer! (Aussie for 'really good') At the time I couldn't understand why the sales were all over the joint. (Aussie for 'place'...not a naughty cigarette.) Now, with experience, I know several factors can influence how the cash box ticks over. There are many external factors that can influence why a sales day goes good or bad. Some of them briefly are: Crowd numbers, buyers or lookers? Close to Mums day, Dads day, Christmas? Is there another event going on to draw the customers away? Is it holiday time and people are away? Do you know people tend to spend more after a long weekend when the shops have not been open? (A craving to shop needs to be filled) The weather, too wet, too cold, too hot? The football. The rotten sods in the next booth who are in direct competition with your product. The type of venue and area, (white collar, blue, tourist, art area, earthy area?) Does this area suit what you are offering? Are you targeting the right audience? I could go on and on, but already you can see that there are many external influences to consider in your success or failure. I wont even start in on the '�nternal factors' that greatly influence your sales...your stand, your product, yourself. That's for a whole other newsletter and not a can of wriggling worms I have time to tackle right now. And lastly there is one other mystery factor...when all the 'T's have been crossed, the 'I's dotted and you made sure you put on your lucky undies...and STILL it went terribly wrong! Why? Who knows why, but one thing I try to remember when walking into any show is to expect the unexpected. What I mean is, there is sometimes no rhyme nor reason when it comes to customers or shows. One week you are at Joe Blog Market, booth #13, stocked to the gills with the best you could muster and walk away hugely disappointed. The next week, same market, same lucky booth, same customers and you walk away with a bum bag full of dollars. Just have faith that you will have a good day again. Keep learning, keep fresh, be unique, research your targets well. *Do I still get scared before big shows? I SURE DO! *Have I had a day where I sold nothing? Yes...one small artsy affair. *Am I confident my work will sell well? No. I am sometimes absolutely certain no one will buy anything and am amazed when the first sale takes place. *Even though my set up seems to work well, do I continually try to improve my stand, my product, my knowledge? You BET I do! It's a dog eat dog world out there. I know this was long winded, but I hear so many of you express fear to chance your hand at exposing your work to the dreaded public that I felt it needed addressing. If they don't buy you feel they almost hate you. If they buy you feel like leaping about like Sally Fields, shouting, 'they love me, they really love me!' Just remember, you are NOT alone. As much as you think the next pyro is selling more than you, it's not so...they have their own bad days too. The above 2 pieces are my first tries on piano key ivory. The one on the left is on a English Pointer and is 3/4 x 3/4 inches in size. The piece on the right is 1 and 1/2 inches long. You can see an enlarged picture of this below...the arrow indicates the actual size of the ivory. Many mechanical things effect the heat of your nib. The temperature dial and the size of the nib you have attached are the most obvious. There is however one other, non-mechanical method of heat control...your breath. Think of this as the fine tuner of your heat control. I will often gently blow on the nib to take the edge off the heat if I need to tone it down while working. This is especially useful when working with a shader and doing very subtle grades of tone. While working, if you get to a patch that needs a softer heat, you simply, ever so softly, blow down on the nib rather than taking you pen off the work and turning the dial down. When you need to have the full heat back to the nib, simply stop blowing. It's also useful for taking the edge off the nib heat before touching down on a surface, to avoid the dreaded black blob.